Hello from the middle of a Chicago winter! I just moved here to take a job with the amazing Hampton Creek Foods (like us on Facebook here). Eva, her boyfriend Omar, and I are all roommates now, which means our apartment is literally 100% of the time filled with delectable vegan food because we all love to cook. As you may have heard, it’s brutal here in the Midwest. Eva says it is close to being the worst winter in 130 years. Lucky us! All of the trees are bare and the lake is frozen where it meets the beach. As a highly color-dependent (is that a thing?) person, this is not an easy time of year for me. 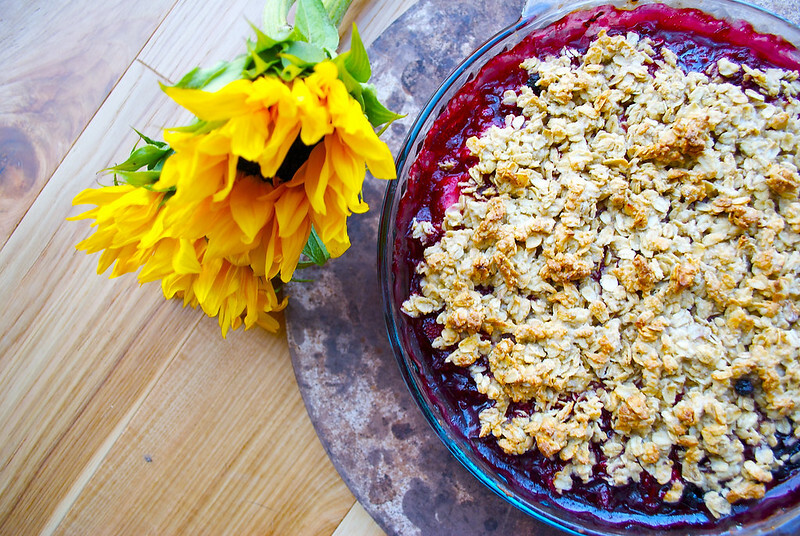 We are about to paint our apartment more colorfully, but until then, we’ve been eating the rainbow, starting with this berry crisp. It’s so easy to make that I tossed it together during my hour-long lunch break. With six cups of berries to boot, it was a very welcome taste of summer. Preheat oven to 35oF. Lightly oil a pie dish. In a large bowl, combine oats, flour, and salt. Stir, and then add milk, oil, and vanilla. 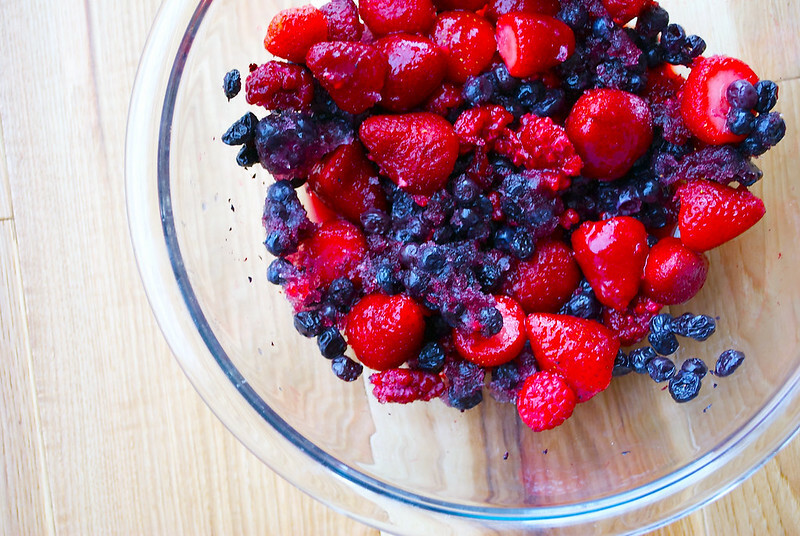 In a separate bowl, combine berries, lemon juice, corn starch, and agave nectar. 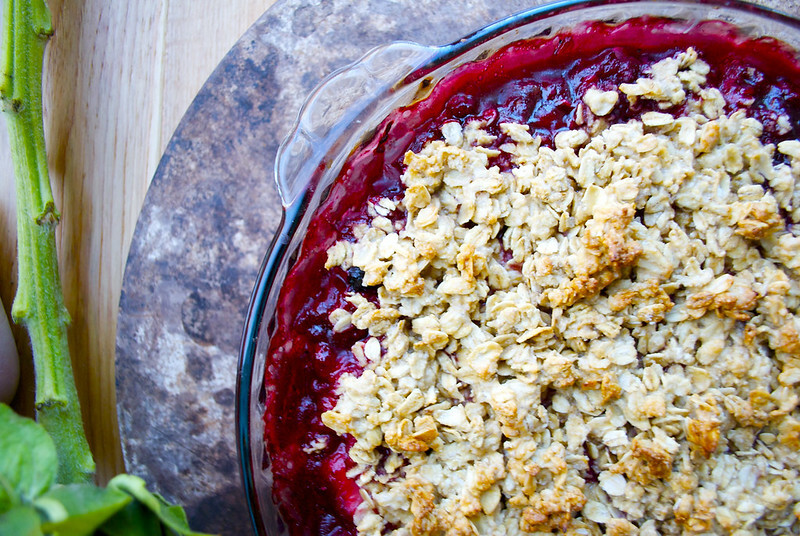 Pour berries into the pie dish, and then use your hands to spread the oat mixture evenly on top. Bake for 40 minutes, or until the oats are golden. 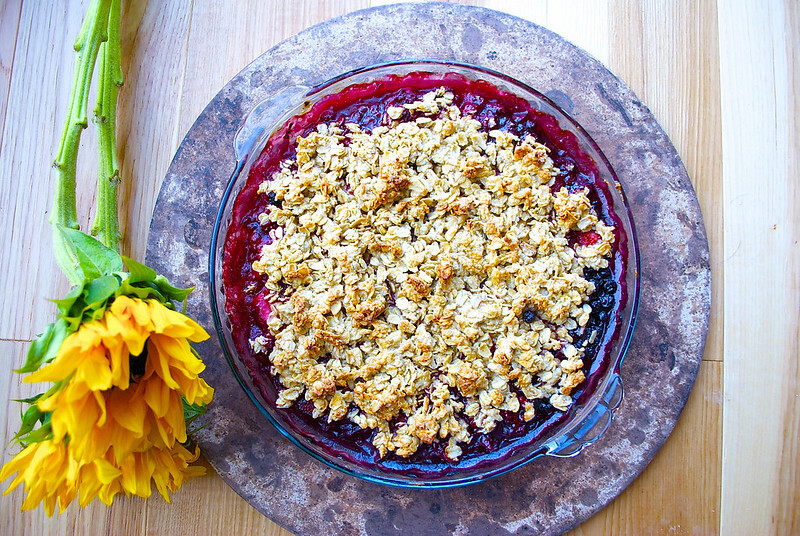 This entry was posted in dessert, Uncategorized and tagged baking, berries, berry, berry crisp, berry crumble, blueberries, blueberry, crisp, crumble, dessert, food, healthy, low-fat, oatmeal, oats, raspberries, raspberry, strawberries, strawberry, sweet, vegan, vegetarian. Bookmark the permalink. Beautiful dish and adding the flowers makes it even more colourful! What a great idea to eat warm berries in the winter; it seems both summery and winterishly comforting.